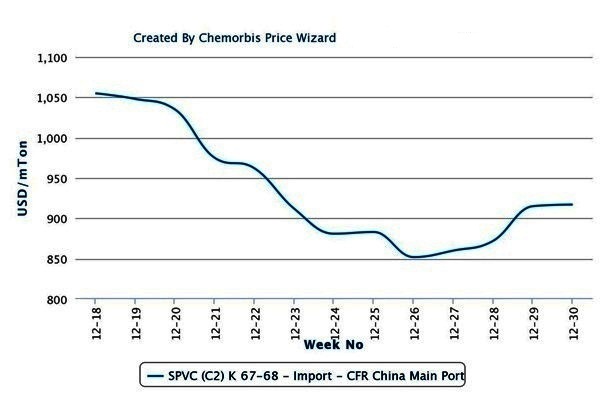 Over the past week, since the Chinese market returned from its May Day holidays, the PVC, PP and PE markets have stemmed the previous price decreasing trend and moved to more solid ground with stable to firmer offers reported for these products as per the pricing service of ChemOrbis. In the PVC market, particularly, many participants used the word “bottom” to describe the PVC price trend. Some buyers were inclined to purchase volumes, albeit in limited quantities, due to the firmer sentiment. Sellers were mixed as to the outlook for June. Some expected price improvement, but qualified that sentiment saying increases would be limited to around $10-30/ton, while one trader expected stable to slightly softer June prices by the same amount. Last year at the same time, PVC import prices to China fell until mid-June. Stabilization took place before another fall at the end of June. At the end of June, a rising trend took hold which lasted throughout the month of July. The PP market similarly saw a change in sentiment this week with sellers standing firmer on prices. This was attributed mainly to the stronger energy markets and stable to firm spot propylene costs. These factors encouraged some demand, but players in China still complained that end demand is not strong enough to support major price increases. In 2012, PP prices bottomed out in mid-May and were stable until the start of June. By mid-June, however, PP prices started an upward trend that lasted through the start of July. 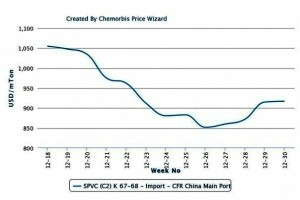 According to ChemOrbis, the PE market this week was encouraged by the same factors, with stronger energy prices leading some sellers to take a confident stance on prices this week. Some sellers elected to raise import and local offers. In 2012, PE prices saw a slight bounce up at the beginning of June, coming off a decreasing trend during May. At the end of June, PE prices touched bottom and then proceeded to climb upwards in July. A major difference between the period of 2012 and 2013 is that crude oil futures fell until the end of June 2012, whereas they have risen over the past three weeks, which has led to some cost-bound demand during this month.